This is a guide into the basic four classes of the game "Journey Into The Beyond" board game being developed by "HandsomeMonkey" on Steam! Hello everyone, welcome to your "Journey Into The Beyond" This game is based off the idea of 4 players, 4 souls, lost in purgatory of a kind. They must defeat the boss of this realm in order to progress to their afterlife they are destined to have. There are the 4 bassic classes, their abilities and skills. A map of which you the players will be using as your board. The many bosses to pick from. An Event deck, Item Deck, Mythic Deck, Potion Deck, and more! All of this and more will be explained later on in this guide! Awaken: The effect with the statement of Awaken is done whenever someone completes an event/situation (Such as a player kill for The Criminal (Being used as the example image) For how someone wakes up depends on the character.) you do the effect how many times you are suppose to do. For example, The Criminal awakens three times whenever she kills someone (as the skull is 3 instead of 1 like the other two ways to awaken!) Thus you'll do her awaken effect (Draw a card) three times. The Map is simple to understand! The Keywords may take a bit of seeing it in action but the map is quite clear and very easy to understand. First to note are the multi-colored tiles. 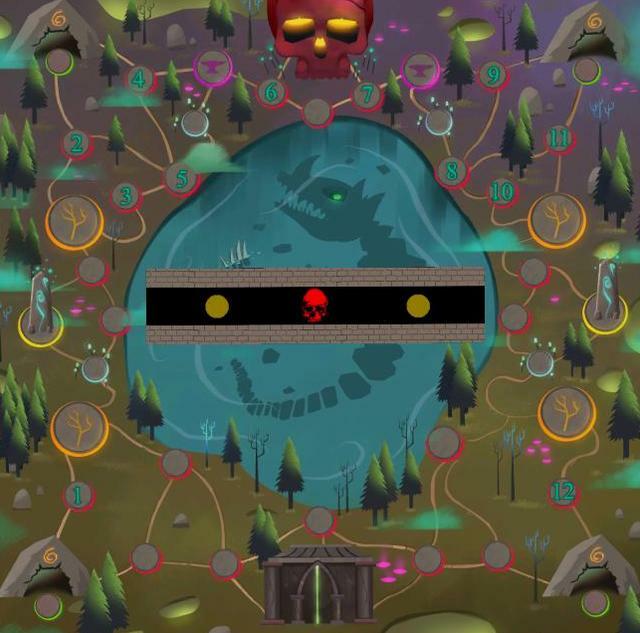 Green, Blue, Red, Purple, Yellow, the "Bridge" in the center, and the "Runestone" like objects. Along with a sort of starting gate on the bottom... Of course the two skulls as well which represent a boss (The big skull on top is the main boss) and the mini-boss on the bridge in the water. Some of them also have a number on them (this will interact with the "Avarice" dice in the mechanics section of the guide! Red = Creature Encounters (Draw the top card of the "Creature" deck). Yellow = Event (Draw the top card of the "Event" deck). Blue = Potion shops/mana pools (Pay X Essence for an item from the potion deck, or as certain classes, gain full mana. This tile is special for The Feral Paragon. As you'll read in her section). Green = Dungeons, Dungeons are unique and that you draw a card from the deck, do the first box, then draw a second card, do the second box ect. Dungeons give rewards when completed (A map piece, some money (20e), and awakens for those who have a little "Mountain" or "Cave"). Purple = Item shops, you can pay to repair your armor, sharpen weapons, and buy/sell items. Yellow Runestones = Sanctuary spaces, you cannot be attacked here. You can also pay 10 Essence in order to unlock extra health (5 per 10 essence, this health does not be given to you when you get it. If you have 20 HP, and buy 3 of these boosts (For a total of 35) you will be at 20 HP until you heal (Or die and go back to spawn) and you pay 5 in order to heal up to full. Finally, by far the most confusing, the bridge spaces. A player can pay 5 Essence to "move" the bridge any number of 45 degree increments. A player can walk on the bridge and pay another 5 to move it again to any number of 45 degree increments. There is also a mini boss who controls the bridge. If you defeat the boss, you no longer have to pay for it, and when another play would pay for it. The money goes to you instead. Its confusing at first, but once you do it a few times it all makes sense! 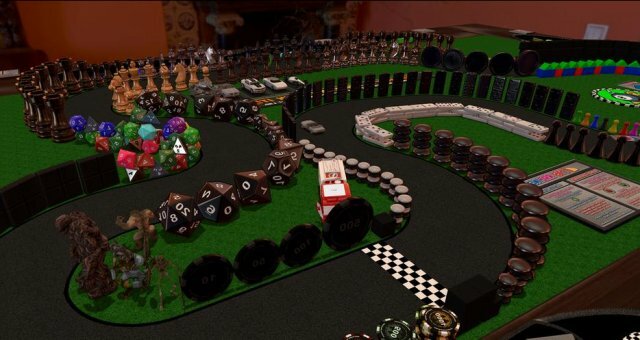 Lastly the spaces with blue numbers interacts with the "Avarice" dice that will be explained in the mechanics! Each character, unless stated otherwise by a card, item, or effect. Has 5 movement they can use however they wish to on the board. One movement is going from one circle space to another (Including on and off a bridge) on the board. So I can move 3 north, and move back 2 south if I wanted to, or any combo inbetween. I do not even have to use all 5 movement. 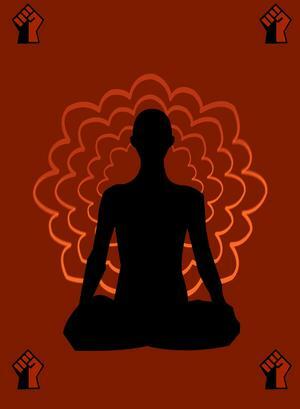 I can move 2 and stop, hell, I don't have to move at all if I want to re-encounter the space I am on! Each one has their own unique style, cards, and skills to work with. The Criminal has her own unique special skills in order to dominate, surprise, and get sudden bursts of utility in order to destroy her enemies. The Lore Keeper is a master of magics, using his spells in order to annihilate his enemies. The Feral Paragon can take form of animals, using their abilities to her advantage! Unlocks more by defeating "Ancients". 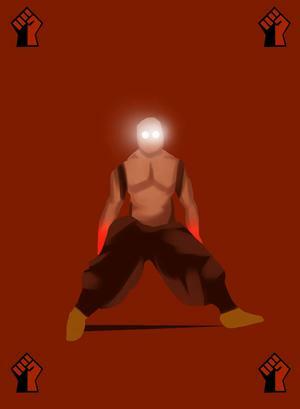 The Wanderer is a lost monk, exploring the land in order to practice his marital arts and forms on his enemies after a bit of training. The concept of The Criminal is pretty clear and clean. She Awakens from Events, Dungeons, and gets to awaken three times from killing her enemies. Out of the first four, she is the most lethal at the start of the game. 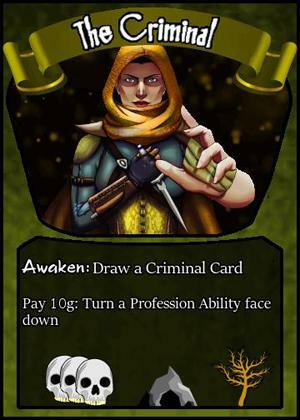 Her Awaken is to draw a card, her deck is completely specialized for what a criminal would do. Tools of the trade giving her advantages in fights, potions and traps to throw at enemies or on the map, and many many more! Now you may have noticed her "Pay 10g: Turn a profession card facedown." As a Criminal, she had a life of crime long before she came here. She has four skills based off of it, professions. Each one having their own effects STUNT, basically the effect of having flipped the card. Then a downside (Or upside!) for having the card face up. By paying 10g, you can turn them facedown and use the STUNT effect again! Note: 10g in the future will become 10e, as the currency in the game is going to swap from gold to essance! They also start off with 10g/e right at the start of the game. Her Professions are the following: Assassin, Burglar, Desperado, and Brigand. 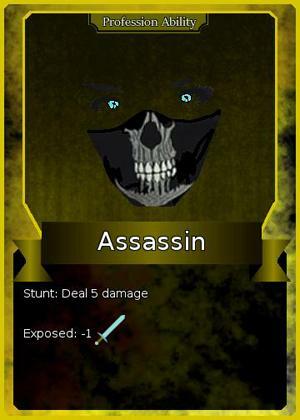 The quickest one to explain, when you use this (by simply flipping it in combat) you will deal 5 damage (or in other words, when a profession is flipped, you do it's "Stunt"). However, as long as it is face up (or as it says on the card "Exposed"!). You will deal -1 physical damage with your weapons (of which you can just pay 10 Essence (Gold) to flip it over). As it says on the card. This card (and its stunt effect) can only be flipped face up when you the criminal draw cards. This includes any cards from any deck. If you draw an Item card, flip this and draw 2 extra. 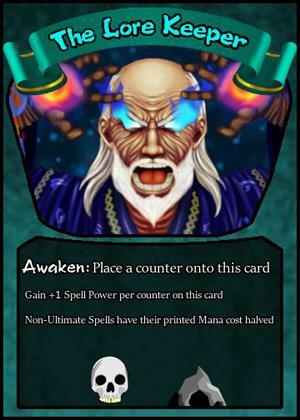 If you awaken you flip and draw 2 extra cards alongside the one you would get from awaken. The downside, the "Exposed" effect is -2 Movement on the map. Which can be quite bad! 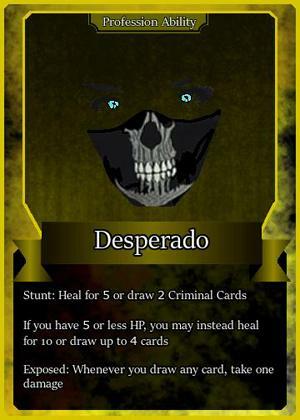 Desperado is the definition of high risk high reward. The Stunt effect either heals you for 5 (or 10 if below 5 HP) and draws you 2 cards (or 4 if below 5 HP) which can get you alot of criminal cards you can use, or heal you in a tight pinch. However, the "Expose" effect is quite bad for you. In fact, when you draw the cards from this card. It will hurt you for each card you draw. So... I ask you, do you feel lucky? 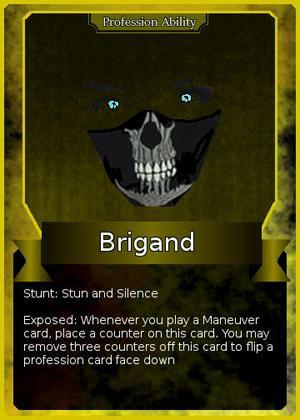 Brigand is both the most unique effect and the most useful as a Criminal. The stunt effect allowing a stun and silence (Of which will be explained in the combat section!) While the "Expose" effect is very good for the Criminal. More cards she plays the more counters she'll get. With 3 she is able to flip A profession card down (including Brigand) and she can then flip that profession again! To do the stunt effect again! At the start of the game, you do this 4 times, giving you a list of spells to work with! Then also pick a "Starting Spell" These are 4 special spells "Blood Surge, Tip the Scales, Frozen Tomb or Living Inferno" which help define what kind of Lore Keeper you're going to be! Note: These special spells, the 3 you have left (after picking one of the four) get shufffled back into the deck for you to memorize and find. Now, under his Awaken, whenever he kills a player or a creature, he gets 2 mana back to work with. This applies during a fight as well, not after! 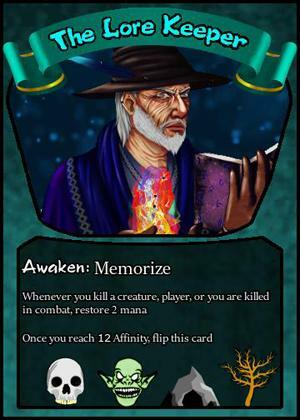 Below that, "Once you reach 12 "Affinity, flip this card". Affinity is a bit complex, so let us start by stating the "houses" of magic for The Lore Keeper. The houses that would "counter" each other stop each other from gaining affinity. So if I have 5 Fire spells, and 2 Ice spells, I have 3 Affinity. As 5 Fire - 2 Ice = 3 total Fire affinity. The opposite is true as well. If I had 5 Ice and 2 Fire, it'd be 3 total Ice affinity. However Arcana counts ALL Affinty for it, AND houses that wouldn't counter each other count towards The Lore Keeper's Affinty. If I had 6 Fire, 4 Death, and 2 Arcana. I'd have 12 total affinity, and we'd flip my Lore Keeper over to the other side. The starting Lore Keeper will memorize quite often! He gets to do it for creatures he kills, events he does, players he kills, and dungeons! You want to flip over as soon as you can, it changes awakens only to player kills and dungeons, but the effect of it is so strong! The Feral Paragon is the least "Luck" based character out of the four. Every thing you will do with her will be planned. At the start of the game she picks an "Aspect" to use (Ox, Raven, Fox, or Badger) each one specialized in their own small way. Ox = Tanky and healing. Raven = Magic power and defenses against magic. Badger = Damage to self, or whenever she takes damage, to gain more. She may only have one of Ox, Raven or Badger Aspect active, as the Fox Aspect states you are allowed to have more than one Aspect active along side the fox one! You will then pick TWO of the "X: Mantle, Crown, Greaves" where X is the aspect you have chosen. 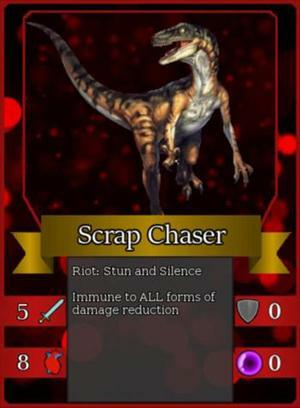 Usually they have a special ability or stats that will state on the card what they do. You may and should have all three pelts of any aspect you have chosen. You earn from from fighting ancients (Just a bit further explains that). After she picks that, her awaken says to "Create an idol" or "Learn a spell" first the spell. That one is quite simple, she'll have a pile of spells near her that she can open up and pick a single spell to use. 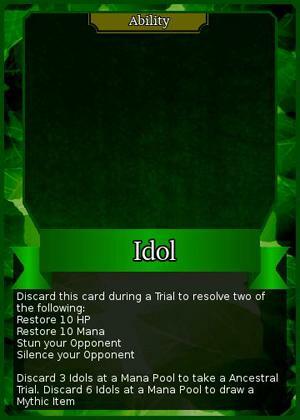 While the "Create an idol" is used for her ancient fights (which are done at the blue mushroom spots, so happens to be the same space she will regain all her mana at the end of her turn!) her idols have many abilities from healing, damage, and CC effects like stun and silence. They can only be used while fighting an ancient UNLESS you have a card that says otherwise! Ancient fights? On the blue mushrooms for her encounter she can choose to fight an anicent instead of a shop. She picks one of three possible ancients face down and fights it. If she wins, she can gain another pelt ability or an entire new aspect + 1 pelt for that aspect. Note: She does not awaken from an ancient fight! She can also use three idols, burning them basically in order to do a harder trial and gain a special type of pelt. An Ancestral trial is fighting two ancients at the same time and pick a pelt from the "Metamorphosis" deck (Which can be used along side any aspect you have). 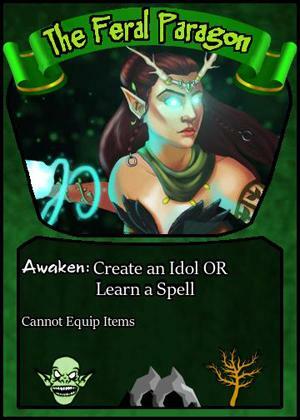 She can also burn all 6 to draw a mythic item, she cannot use equipment so she keeps drawing until she gets a special card called "Nether Pact" which unlocks a shadow form of The Feral Paragon. Of which is a more advanced version of her. For this guide I will not be explaining what it does, nor will I explain anyone's Nether Pacts. She might sound overwhelming compared to The Lore Keeper and The Criminal, but she is by far the most simple to pick up first! The Wanderer is a lost soul, you as the player choose one form, or disciple, for the lost Wanderer to follow. You pick one of the three decks, each one with 15 cards to pick from. Finding a balance between knowing when to use abilities and when not to. A style of methodical thinking, knowing what your enemy WANTS to do, and knowing what you can do to STOP them from doing it. Marital prowess, focuses on having advantages (Such as higher attack value) over their enemy in order to overpower them. 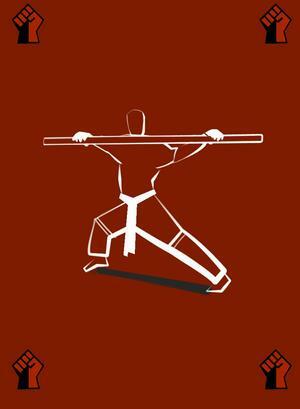 Using physical weapons and abilities able to double his damage when combined together. High risk high reward, all or nothing play style, throws regard to the wind. Focusing on "last stand" moments and giving into "his rage" in order to defy death. Each one having their own "Masteries" adding more to the playing style each one has. Masteries are passive or active effects that you can do usually during combat for an effect. 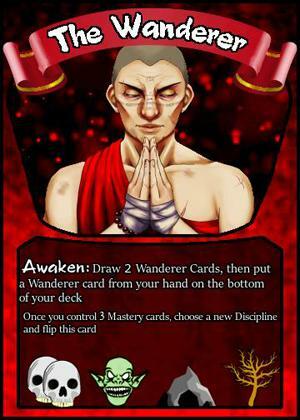 The Wanderer awakens by doing anything, he draws 2 cards and picks one to keep. If any effect would allow him to draw more than one card. He only needs to put one back on the bottom of the deck! this allows the Wanderer to "Keep Track" of whats in his deck and what he could draw next! After he would place all three masteries down. Note: You do not need to place a mastery down when you draw it. You may keep it in your hand if you do not wish to flip over to the other side yet! He flips over to the other side. Where you pick another one of your decks to work with. Allowing synergy bonuses and another set of masteries and tools to work with. 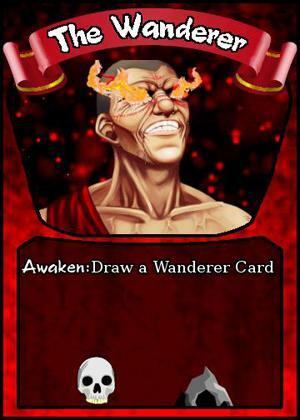 His awakens becomes DRAW a Wanderer card, while he only Awakens from kills and dungeons! Thus is a more "Late game" flip to do after you've drawn all or most of the deck you start with! Likely this boss will be the one to start with, as she is the easiest boss to understand, and has no serious mechanics besides her little babies she spawns. 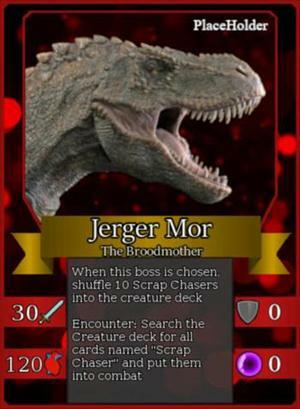 Her name is Jerger Mor, The Broodmother. With her children, Scrap Chasers.